Published in 2012, predates Keith Haddock’s 2016 book on the subject of British surface mining while providing more recent coverage. 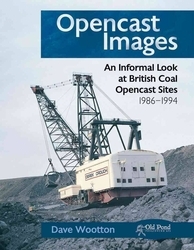 The author presents a tour of over 30 mines operated by British Opencast Coal until its privatization in 1994, with panoramas of the pits and closeups of the wide variety of machines used by the mining contractors. 176 pages, hardbound, 230 color photographs.